eDocEngine has "report-export interface components" for providing multiple output format support for Delphi reporting tools. 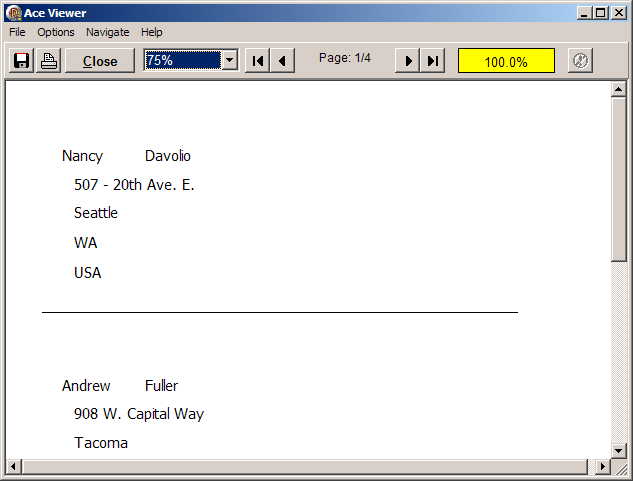 For ACE Reporter, eDocEngine has the TgtAceExportInterface interface component. You can either let the end-user of the Ace Reporter application to choose the output provided by eDocEngine in an interactive report "Save" dialog box or you could export the report programmatically in Object Pascal. On an application built with ACE Reporter, pair an instance of this interface component with an eDocEngine document-creation engine component. 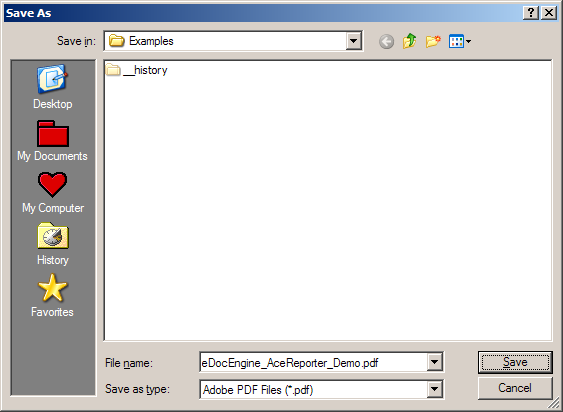 For example, to output ACE Reporter reports documents to PDF, a TgtAceExportInterface instance needs to be paired with a TgtPDFEngine instance on the same form as the TSctReport. If you want to create a simple ACE Reporter application where the end-user will select the eDocEngine-generated output, try the following steps. Open your IDE and create a VCL Forms Application. Drop the following components on the the form. Set the Engine property of one of the TgtAceExportInterface control to the TgtPDFEngine control. Set the Engine property of one of the other TgtAceExportInterface control to the TgtRTFEngine control. Set the following properties of the TADODataSet control. ConnectionString: Set it to a database. 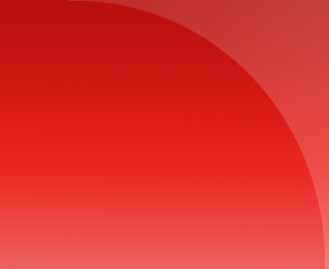 CommandText: Set an SQL query that retrieves records from the database. Set the DataSet property of the TDataSource control to the TADODataSet control. 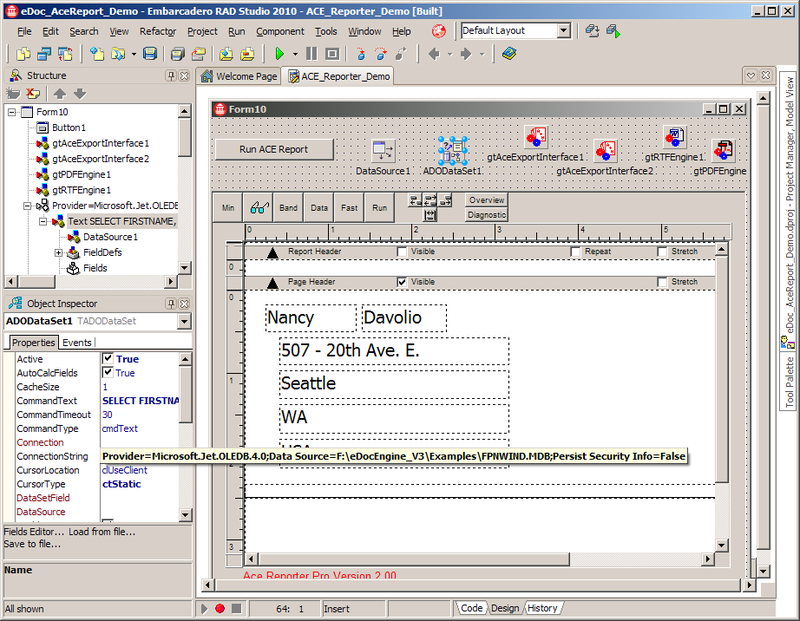 Select the TSctGrouppage (ReportPage) object and set the DataSource property to TDataSource control. Drop some TSctvarlabel controls on the Detail band of the report. Set the Variable property of the TSctvarlabel objects to a field returned by the SQL query. Double-click the TButton object and add the following click-event handler. Run the project and click the button on the window of the form. 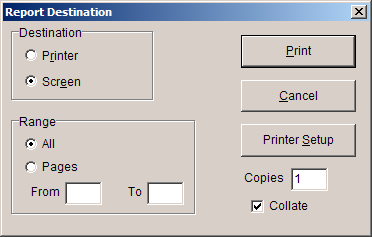 The Report Destination dialog will then be displayed. Click the Print button to display the ACE Viewer. Click the Save Report icon to display the Save As dialog. In the Save as type list, select one of the output formats supported by eDocEngine. Enter name for the PDF document in the File name box and click Save. The TgtAceExportInterface component has two methods to export reports. If your form has a fully set-up TSctReport control, then drop a TgtAceExportInterface and a TgtPDFEngine control on it. Then, drop a button and set this click-event handler to it. If you have an ".ACE" file, then drop a TgtAceExportInterface and a TgtPDFEngine control on a form that contains a TSctReport control. Next, drop a TgtAceExportInterface and TgtPDFEngine.